When the Society for Psychical Research (S.P.R.) was founded in 1882 research into phenomena and experiences suggesting personal survival of man after death took a high priority. Its findings were constantly under fire from the scientific establishment, which frowned even upon the notion psychical research being considered a science - after all paranormal phenomena did not exist at all! A belief still cherished. Investigators of the S.P.R. became so influenced by these attacks and were so eager to find favour in the eyes of their antagonists that they began to take over their condemning attitude. A common psychological trait - the oppressed identifying themselves with the worst characteristics of their tormentors. Supernatural phenomena are still being dismissed by the academic community. Influenced by recent breaktroughs leading to an explanation of some mysteries, they have come to the conclusion that science will explain all eventually. Scientists, who would not dare to trespass in fields outside their speciality for fear of being torn apart by fellow academics, feel free to make all sorts of pronouncements in the media on subjects in the domain of parapsychological research, of which they have no knowledge whatsoever. An exception should be made for those scientists - amongst them Nobel prize winners - who have endaevoured to research in an objective manner phenomena that suggest continuance of life after death for almost 150 years. Like in all other areas of science, parapsychology has narrowed down its research to specialist sectors, hardly anyone daring to voice an opinion on general issues. As to research into personal survival after death, although no absolute proof in a scientific sense has been established, there are strong convergent arguments in its favour. Human consciousness can exist independent of brain-activity. Reductionism/Epiphenomenalism has long been a pet notion of psychology, specially in behaviourism. Now that psychology's own principles have been shaken after recent discoveries in genetics the idea that consciousness is merely an effect of brain-activity is being questioned again. Brain specialists, Prof. J.C.Eccles, Sir Cyril Burt, Dr.Wilder Penfield and Prof.W.H.Thorpe stated that in their opinion the brain appears to be more a complicated organism to register and channel consciousness rather than produce it. 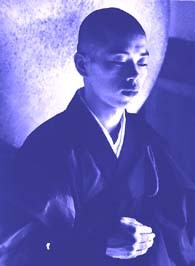 "The brain is messenger to consciousness", Eccles said. In his famous debate with philosopher Popper "The self and its brain" this matter was examined further. Consciousness, the subjective experience of an inner self, could be a phenomenon forever beyond the reach of neuroscience. Even a detailed knowledge of the brain's workings and the neural correlates of consciousness may fail to explain how or why human beings have self-aware minds. It is remarkable that in most predictions about discoveries anticipated in this century a breakthrough in parapsychology is not even mentioned or hoped for. Yet developing its 'extra dimensional' powers is the only way for mankind to overcome its isolation in the universe as a result of the space/time barrier. One has not woken up to the fact that there are no other means left. One may assume that advanced extraterrestrial civilisations will have developed precisely these powers. Telepathy. Almost everyone knows an instance of the so-called sixth sense, yet science pronounces that this power to be aware of someone else's thoughts does not exist as it has no physical basis. The same applies to clairvoyance - awareness of an object or event at a distance not through the normal senses. Precognition - foreseeing an event in future. Psychokinesis(PK) or mind over matter. Exercising power over objects outside of human physical reach. Levitation being one of these phenomena. Bi-location A person being seen at two places at the same time. Psychic healing. Healing that cannot be explained by normal means. Transmission of power. Dowsing. The ability to feel the presence of underground water, ores etc. Psychometry. The ability to pick up information about a person - past, present or future - by handling an object that belonged to him/her. These widely reported supernatural abililities, which to my regret I cannot go further into here, cannot be attributed to the mere functioning of the physical brain. Man's spiritual nature is another ticklish matter for scientists excelling in cerebral activity. Yet, these faculties distinquish man from the animal. History has given us sufficient testimony as to his ability to tune in to a divine spiritual reality. With his sublime creative powers bordering on genius man can create works of art that are everlasting. Saints, sages, mystics and great artists have laid the foundation of human culture in a relatively short time in evolution. Mystics and founders of religions have testified to man's ability to free him/herself from the clutches of temporal existence by opening himself to the Divine. Being able to transcend time and space could mean that in the depth of his nature man is connected to an extradimensional continuum. Another phenomenon that indicates that the mind can operate independent of the body is that of ESP projection. 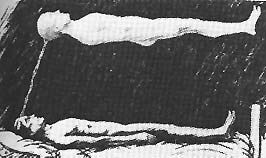 During OBE's (Out-Of-the-Body experiences) occurring during sleep, narcosis or other circumstances, people have actually felt leaving their bodies. From a point in space they saw themselves lying in bed. Prof.C.G.Jung for instance observed activities in his hospital room whilst he was in coma. Other patients saw incidents in the street, an impossible feat from their beds. Thanks to progress in medical science, more and more patients are resuscitated from clinical death. Some of them report experiences which bear great similarity, such as passing through a tunnel, being received by deceased members of the family, or a radiant figure, before entering in a heavenly sphere in a state of great euphoria. As a result of continuing research in the last decades more and more of these experiences could be recorded, compared and analysed. It is noteworthy that these patients saw only relatives and friends who had died, in the 'hereafter'. In exceptional cases they even saw people who they surmised still being alive, but whose death announcement had not reached them as yet. Of course specialists have endaevoured to wave this argument away, but psychiatrist Bruce Greyson writes in The Lancet of Febr.5th 2000 after having examined all bio- and neurochemical explanations that these do not offer any satisfactory solution for this phenomenon. The Lancet of 15th December 2001 published an extensive NDE study of Pim van Lommel, MD, cardiologist at Rijnstate Hospital in Arnhem, Netherlands. He relates: A patient saw during a NDE besides his deceased grandmother another man who looked at him full of love. Yet he did not know him. More than ten years later he learned that he was born out of wedlock with a Jewish man during WW2. This man was deported and killed. When he was shown a photo of his biological father he recognised him as the man he had seen ten years before during his NDE ! Pim van Lommel concludes: "NDE pushes the limits of medical ideas about the range of human consciousness and the mind-brain relationship." Nobel prize winner Prof. Charles Richet, who took a deep interest in psychical research, was most impressed by deathbed visions. Prof. Karlis Osis has done great work in collecting accounts of doctors and nurses on this phenomenon. Patients, whose last hour has struck, have been reported seeing visions of near relatives appearing at their bedside. They have been seen focusing their attention on a point in space where they see the apparition. In rare cases people present in the room see the apparition as well, feel an unexplainable cold draught, hear a rushing sound, or see some kind of curious lumininosity. Other visitors may partake in the resulting exaltation. As in the case of near-death-experiences the dying only see apparitions of deceased people. Again there are instances of patients who saw people who they surmised were still alive, but in fact had died without them knowing so. Have you ever, when believing yourself completely awake, had a vivid impression of seeing or being touched by a living being or an inanimate object or of hearing a voice; which impression was not due to any external physical cause? In this "Census of Hallucinations" some 17000 cases were being studied and the most trustworthy published. It was ascertained that about 10% of the population had such an experience. 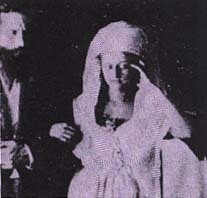 The conclusion was that there must be some connection between the death of a person and an apparition. Sometimes the phantasm of a deceased person seems to come for the sole purpose of conveying urgent information to the surviving relative. In one of such cases the late farmer James Chaffin appeared to his son to show him that he had hidden in his Bible his last will. Many cases have been documented of people being forewarned of a coming disaster by an apparition. In other cases apparitions, sometimes seen as angels, gave life saving advice. 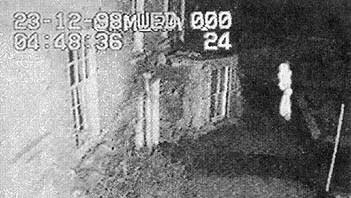 Apparition (in white) filmed on video in 1998 at Belgrave Hall Museum, Leicester, UK (dating from 1709). Curator vouches for authenticity. 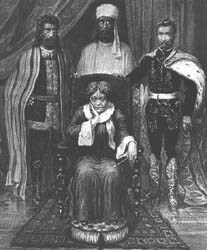 Apparitions have been observed to cast a shadow, be reflected in a mirror, overturn furniture, make sounds whilst walking, leave a scent, ask for a lift, in short, demonstrate to possess an active intelligence. A popular saying has it that no one has ever returned to tell what happened after death. They do not take into consideration then the millions of communications said to have been received by the survivors directly, or by means of a psychically gifted person - a medium. This contact with the dead has been reported to us from the dawn of mankind. Thousands of books have been filled with descriptions of the hereafter. Some of these communications were dictated whilst the recipient was asleep. In other cases one hand just scribbled on its own accord the messages whilst the receiver was either asleep or conducting a conversation. Messages have revealed facts no one alive could have ever known. With some mediums so-called 'drop-in communicators' manifested. They were quite unknown to anyone present and told particulars of their former life in another country. What they told was verified in that country at a later date. The results of the investigation confirmed what was told at the seance. 'A course in miracles' (1975), even in academic circles being acknowledged for its spiritual depth, was being dictated to an atheist, non-believing professor in psychology, Helen Schucman. Dr.A. Crookall, who studied a host of these communications was struck by the fact that they bore a great similarity in the description of the after death states. In S.P.R. Proceedings hundreds of pages have been devoted to alleged cross-correspondences in messages received by a number of mediums living far apart independently. Sentences received by one medium were completed through another who was not aware of the other incomplete message. The correspondence between the messages was detected later by a research-officer of the S.P.R. No doubt the strongest impression ever to be made on man is that of the physical appearance of a dead one. The so-called materializations are said to be composed of that strange substance ectoplasm. For a further description I refer the reader to my page The presence phenomenon (click). Nobel prize winner Prof.William Crookes shook hands with a materialized spirit named Katie King and photographed her in his laboratory. S.P.R. correspondent Dr. G.Zorab, after studying all the witness reports, concludes that the experiments cannot be just put aside by infering that Prof.Crookes was fooled by magical tricks. Another means of communication that has great persuasive power is that of the direct voice - a voice manifesting in space, normally in the vicinity of the medium, or a registration on audio-tape (see below). On my page Paranormal Voices more info is given on this phenomenon. Numerous cases have been reported of young children remembering a previous incarnation, showing even birth marks of supposed injuries in a previous life. Prof.Ian Stevenson has collected the most striking cases of this kind. Nature-nurture research has shown that babies are born with dispositions, allergies, temperament and personalities which are difficult to explain by the structure of the DNA. In the last decades regressions to previous lives under hypnosis have been put forward as "proof" for survival after death. Sometimes the person remembering a previous incarnation may furnish historical data that were lost, but could still be verified after intensive research. Reincarnation helps to explain the origin of particular talents, phobias, fears, preferences and characteristics that make up man's identity. Its chief weakness is its failure to explain convincingly the origin of the increasing number of human souls that are being born. The personality and character of man seems to be made up of his genetics, upbringing and fate. The soul, a link to the Divine, remains an intangible mystery. None of the above ten arguments in itself is sufficient proof for personal survival after death. Yet, taken together, the above phenomena constitute a solid body of testimony in favour of the belief. Author J.Vyvyan argues in his "A case against Jones" (Ernest Jones being the great behaviourist psychiatrist) that if ever a case for or against survival would have to be fought in court, a jury might well be convinced of a life after death on the basis of the above arguments. Prof. Hornell Hart, after weighing up all the pros and cons comes to the conclusion: "Human personality does survive bodily death. That is the outcome which I find emerging when the strongest anti-survivalist arguments and the strongest rebuttals are considered thoroughly, with passionate open-mindedness." In spite of widespread public interest in the abovementioned phenomena (a recent survey shows that over half of the adults in the United States have had paranormal experiences) the science of parapsychology is in a phase of decline in the last decades. One of the reasons being given is that the advancement of rationalized society entails the marginalization or elimination of its adversary, the paranormal. Yet, let us not forget that mankind all through its history has left traces or records evincing that it believed that life did not end at death based on their experiences. In the oldest graves objects have been found for the deceased to carry to his new abode. It is only in the past century that this belief has been assailed by the scientific establishment which itself staggered from one shattered paradigm to another. Acceptance of the idea of a life after death raises of course other questions. When and where did such a 'hereafter' state come into being ? Does it apply to all living organisms ? Evolution of physical life was a slow process, taking hundreds of millions of years. Was a similar process taking place on a consciousness layer ? I have gone into these questions on my Philosophical Reflections page. Survival of bodily death. A statement by a group of scholars and scientists. Life after Death?, by Dr. Karlis Osis Ph.D.
All through history there have been reports of voices and sounds heard at a distance from the person(s) who heard them. But also in less dramatic circumstances were voices heard, often in the vicinity of children - the so-called poltergeist phenomena. 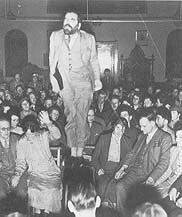 Finally such voices have been heard in the seance room of mediums in the past 160 years in the wake of modern spiritism. These voices should not be confused with taperecorder, or Raudive, registrations on tape (EVP). These are very short and require a trained ear to detect and interpret. Direct voices can be heard as any other sound and recorded. The Woods/Greene collection contains such recordings of direct voices. A few are provided as sound-clips. Click here for more info. and here for Youtube video clips on paranormal voices. The New Age movement is hardly novel! It is rooted in age-old traditions and mystical experiences going back to the dawn of mankind. For further reading on the pioneers of the esoteric tradition: click here. Return to main/index-page for more info on related subjects. Initiated 1996. Latest update: 12 January 2019.